In 1961 Hannah Arendt attended the trial of Adolf Eichmann in Jerusalem and coined the phrase "the banality of evil". That straightforward, iconic phrase quickly came to define one of the most publicised trials of the 20th century, perfectly encapsulating the frustrations of having an architect of one of the most horrific acts in human history on trial, and finding him to be 'just' a boring, run-of-the-mill bureaucrat. This film chronicles the impact of this trial on Arendt and the wider Jewish diaspora, following her as she travels to Israel to observe the trial, followed by her articles in the New Yorker and her controversial book Eichmann in Jerusalem, whose publication kicked up one hell of a stink. Though Hannah Arendt keeps its focus on events surrounding the Eichmann trial, it also attempts to give us at least a cursory biography of its subject. She led a fascinating life, born to German Jews in Hanover, and going on to study philosophy under Martin Heidegger. As a student she entered into a passionate and complex romantic relationship with Heidegger, one severely tested by his support for the Nazi Party and her Jewish ancestry. As the Nazis tightened their grip on German institutions the life of a German-Jewish political theorist became ever more dangerous and she was forced to flee Germany for Paris in 1933. In 1940 the Vichy Regime began to deport Jews to Nazi concentration camps. Arendt was arrested and interned as an "enemy alien". Again she was forced to flee, this time crossing the Atlantic to New York where she worked on behalf of Jewish organisations to aid those stranded in Europe. By the time we meet her in this film Arendt is a respected author, thinker and professor at the New School in New York, with a major work The Origins of Totalitarianism under her belt. Barbara Sukowa plays her as confident and forthright, a woman possessed by the courage of her convictions and more than able to defend her views. She occupies a rarefied New York intellectual ocean, within which she is regarded as something of a big fish. Sukowa neatly captures the cloud of intimidation that accompanies people who are not only remarkable thinkers, but are all too aware of their own exceptionality. 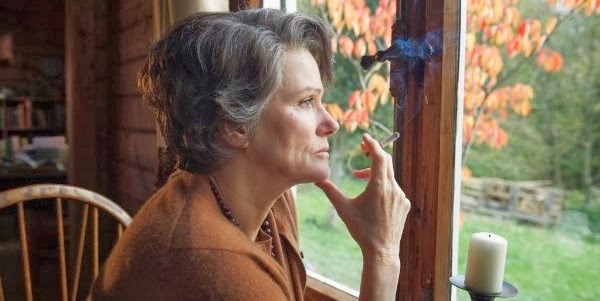 This stern, rigorous, chain-smoking exterior softens when she's alone with her beloved husband, but in all other regards the defences are up, the film making much of her stony face, behind which you can practically see the cogs and gears of her impressive mind whirring. 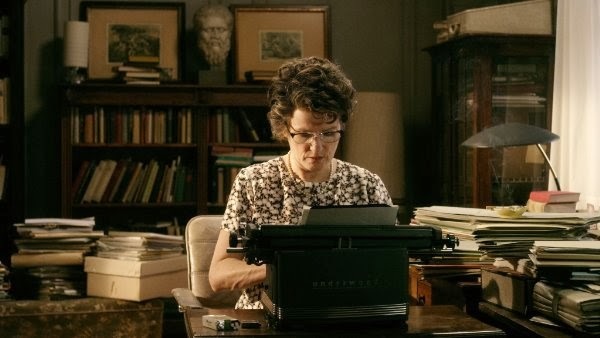 It's of course entirely appropriate that Hannah Arendt should be a cerebral film, and there's a refreshing lack of melodrama, the core premise being the publication of a political work, then subsequently defending it. As concepts go it's not immediately thrilling; after all, showing someone lying around smoking cigarettes and thinking really hard isn't exactly dynamic cinema. But rather than try to jazz things up, Von Trotta embraces a kind of no-frills aesthetic; working with a digitally restrained, desaturated colour palette and the absolute bare minimum of directorial frippery. This avoidance of any hint of studio glamour means the style of the film becomes a reflection of its subject, though that also means its a bit detached. It's telling that the scenes where you get hints of genuine passion are the lectures/monologues by Arendt (which I assume are verbatim quotes). This reveals the film's true intention: not to entertain but to teach. There are moments when the film almost becomes a documentary, particularly during the Eichmann trial sequence where archive footage is cross-cut with a recreation. Particularly effective is the decision to only use footage of the real Eichmann rather than hire a lookalike. We can't help but stare into his face as he blithely argues that he was "just following orders". We try our best to somehow spot the monster within, but in the end we must throw up our hands and admit that there's nothing here except Arendt's "banal" man - a tactic that cleverly nudges us towards looking through Arendt's eyes. Clever though this is it results in a smidge of intellectual myopia. As controversy builds concerning Arendt's arguments, we're told that numerous rebuttals to her are being published, but we never see them. This is a film that relies on a certain intelligence in its audience, so when we're confronted by the antagonists - represented as a gaggle of cartoon critics replete with snooty insults - it stands out as weirdly simplistic. It's totally reasonable for a film to take a certain viewpoint but it displays a curious lack of confidence to deprive us of even considering the opposing view. It's refreshing to see a film that aims for the head rather than the heart; a film that understands that you don't need to dumb anything down and that simply being interesting and intelligent is more than enough to sustain our attention. The production design, score and performances are all quietly evocative without being overbearing, and Sukowa manages to make a restrained, frosty and intimidating woman heroic and charismatic at best, and deserving of respect at minimum. But the best praise I can give to Hannah Arendt is that it acts as a springboard to further learning, giving us a compelling and accurate overview of the life and work of a fascinating political theorist and academic. 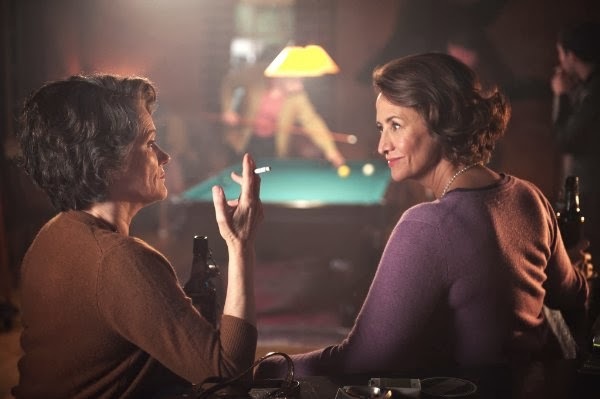 'Hannah Arendt' is released on DVD today.